Officials say Tuesday's election proceeded smoothly despite controversy surrounding the newly implemented voter ID law, but some worry that could change in coming elections with increased voter turnout. Tuesday marked the first statewide election in which voters had to show a photo ID to cast their ballots, and though elections officials say the process went smoothly, some worry that could change in future elections with increased voter turnout. Election officials from some of the state’s 10 most populous counties said there were few instances in which voters were unable to cast their ballots or had to cast provisional ballots because of questions about their ID. Still, because of the new law, thousands of voters were required to sign affidavits affirming their identity before voting. State lawmakers in 2011 passed the voter identification bill, which requires voters to show one of seven state or federally issued forms of ID in order to vote. It was on hold after opponents, including the U.S. Department of Justice, sued the state, claiming that the law was unconstitutional. A U.S. Supreme Court decision in June allowed the state to move forward in time for Tuesday's election. John Oldham, the elections administrator in Fort Bend County, estimated that at least 40 percent of early voters in his county signed affidavits — often a result of discrepancies between a voter’s name on his or her photo ID and in the voter registry. “We have not been made aware of any provisional ballots for photo ID,” Oldham said. In Travis County, about 20 percent of the nearly 32,000 individuals who cast ballots during early voting had to sign affidavits because of the same discrepancy, said Travis County Clerk Dana DeBeauvoir. “We think most of the people who had those issues were women,” DeBeauvoir said. Many voting rights advocates worried that the law would particularly affect women, who often change their names after marriage or divorce. Frank Phillips, the Denton County elections administrator, said that there were no major issues related to the voter ID law, but that “quite a few” individuals had to sign affidavits to vote. Prominent elected officials, including 2014 gubernatorial hopefuls Texas Attorney General Greg Abbott and state Sen. Wendy Davis, were among the many voters required to sign affidavits because of name discrepancies. During early voting, Abbott carried a photo ID that included his middle name, and Davis’ photo ID had her maiden name. Neither names matched what was listed in the voter registry. When the voter ID bill was up for consideration in the Texas Senate, Davis, a Fort Worth Democrat, introduced the amendment that allowed individuals to sign affidavits that would permit them to vote if their name was substantially similar to the one on their identification. Proponents of the voter ID bill, including Republican Party of Texas chairman Steve Munisteri, blamed Davis' amendment for any hassles with affidavits. 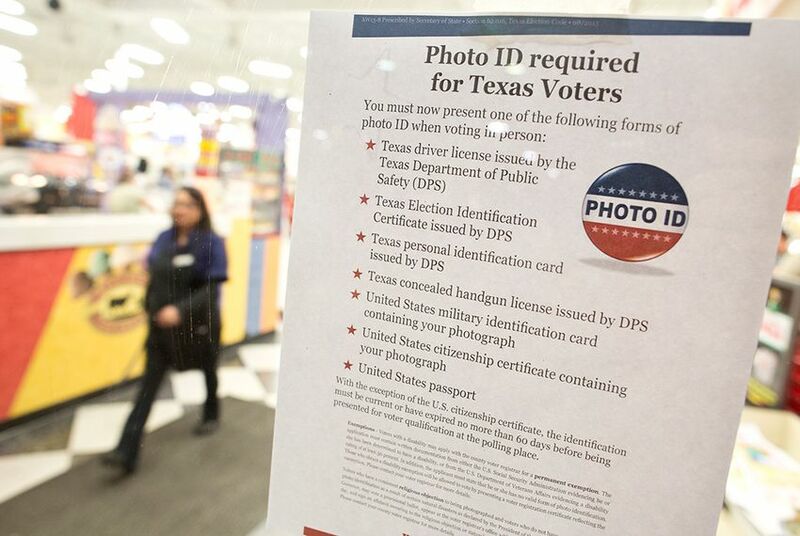 “It reinforces our argument from the start that there isn’t any valid reason not to have voter ID,” Munisteri said. At a press conference on Monday, Secretary of State John Steen suggested the state had benefited from the voter ID law. The implementation of the voter ID law helped bring attention to the constitutional amendment election, which usually generates a small turnout, Steen said. In the 15 most populous counties, 317,752 voters cast ballots during early voting — almost double the early voting turnout in 2011, according to the secretary of state's office. While the office relied on a new website and television and radio commercials throughout the state to educate voters about the law, some local election officials said they had few resources and little time to tell voters about the new law. Oldham said his office hung about 6,000 posters from the secretary of state’s office around the county. Several election offices recorded explanations of the new law on their automated phone answering systems. Some election offices reminded voters with large banners, on their websites or through social media. In Fort Worth and Dallas counties, the offices of the secretary of state and the Texas Department of Public Safety launched mobile stations to help voters obtain election identification certificates. Opponents of the law continue to claim it creates barriers to voting that could disenfranchise poor and minority voters. Researchers at the Brennan Center for Justice, a public policy institute at the New York University School of Law, estimate that one in 10 eligible voters nationwide lacks a photo ID. While on his way to vote in Harlingen on Tuesday afternoon, Gilberto Hinojosa, chairman of the Texas Democratic Party, said he expected to be required to sign an affidavit because of a discrepancy between his driver’s licence and voter registration card. Some election officials, though, were more concerned with how the law will work in future elections. Steve Raborn, the elections administrator for Tarrant County, said he was glad Tuesday’s election gave officials an opportunity to work out any "kinks" with the implementation. “I think the elections next year are the truer test,” he said.